Kogane-ya store front, late afternoon. One of my firmest beliefs is that food and farming possess real potential as economic engines. Readers of this blog won't be surprised to see that nor will they be surprised to learn that the group I see as a positive force for the future are small farmers and producers. Small farmers and farmer's markets offer up jobs and economic stability along with tables full of seasonal fruit, vegetables, and locally produced goods. Small farmers and producers are invested in their community because the community is their home as well as their customers. By supporting them I'm helping keep jobs in my community, good land growing food I get to eat, and getting to know a new recipe or two. All of this brings me to Kogane-ya. 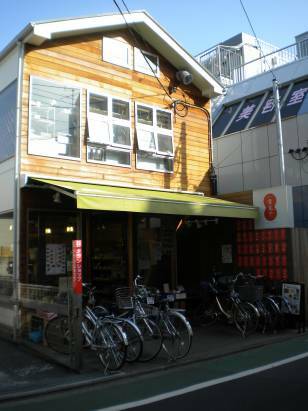 An unassuming little shop on the south side of Higashi-Kogane station, the name literally translates as "Kogane store." Initially drawn there one evening by the warmly lit interior and a lovely display of vegetables out front, I ventured in to warm up and take a closer look. 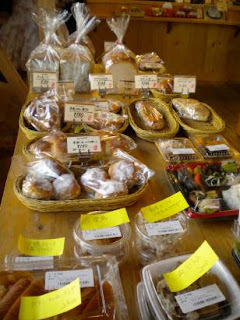 Inside was what at first glance felt like a rather haphazard selection of items – senbei, tea, loaves of bread, a selection of soaps, soba and udon noodles, ceramics, and eggs – until our chat with the man behind the counter revealed we were in an antenna shop. An antenna shop in its usual form features products and produce from a particular prefecture. Every item for sale is made or produced in the prefecture in question, and often a small cafe on site serves up a selection of local dishes again made with local ingredients. Visitors can find everything from Hokkaido cheese to Miyazaki's tropical fruits to Okinawaan shochu to share as a special gift or simple sample for themselves. Kogane-ya does this exact same thing, but showcases instead good and products from this little Tokyo suburb located roughly forty minutes west of Shinjuku. Nearly 70 local businesses, including 11 farms, are represented on shelves well-stocked with everything from the previously mentioned items to locally made meats, rice, desserts, honey and jam. Throw in some jewelry, and a variety of other handicrafts and some good gift shopping can be accomplished while picking up groceries. Hungry? Settle in at one of the many tables in the sunny upstairs cafe to enjoy a cup of coffee, one of the daily lunch specials and watch people flow by on the street below. Directions: A five minute walk from the south exit of Higashi-Kogane Station, look for a small wooden store on the left across from the convenience store. Want to see more antenna shops? 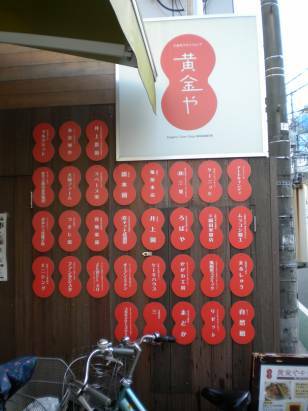 Check out these posts at FoodSakeTokyo and head on out! It is very cool and a really interesting idea. And the food is darn yummy! We'll add it to your list of spots to see.